So, you’ve got your hands on your first 5-string banjo and now (naturally) you want to learn how to play the darn thing. And that’s when you make the discovery: there’s actually two styles of playing – clawhammer and bluegrass – common to the 5-string. So how the heck do you decide which one to learn?? Clawhammer banjo, or frailing, traces its roots back to West Africa and was introduced to the American Colonies by African slaves. By the time of the American Revolution, this style of playing had become firmly established as a staple of American plantation music. In the early nineteenth century, it became an integral part of American minstrel shows, a form of entertainment that parodied southern plantation life. These shows, performed widely in both the New World and Europe, were responsible for introducing clawhammer banjo to the world. You might be surprised to learn that BLUEGRASS banjo is at least three centuries younger than clawhammer banjo; it was developed in the American south in the early twentieth century. Unlike clawhammer, bluegrass banjo avoids strumming altogether. Instead, fingerpicks are used on the thumb, index and middle fingers; the strings are plucked in the same manner a classical guitarist plucks the strings of a guitar. Earl Scruggs is generally considered to be the originator of this style of banjo playing. Despite the assumption that he singlehandedly “invented” bluegrass banjo, Scruggs had contemporaries who used a similar three-finger style approach. Scruggs simply borrowed ideas from these pickers and synthesized them into a more refined, flashier style. Scruggs also had the advantage of being the first banjo player to showcase this style of playing to a wide audience through his work with Bill Monroe and the Bluegrass Boys at the Grand Ole Opry. The defining feature of bluegrass banjo playing (commonly referred to as “Scruggs style”) is that the melody of a song is embedded in a series of picking patterns called “rolls.” These rolls are what make bluegrass banjo playing sound so impressive. 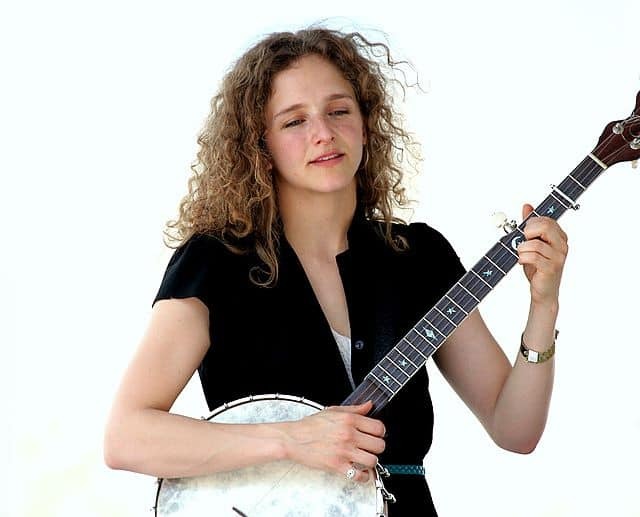 Unlike clawhammer banjo, whose melodies tend to be fairly discernible, in bluegrass banjo the melody of a song can often become lost in a tidal wave of other notes (which is why this style of playing is so ear-catching). Now that you have a basic idea of these two different styles of banjo playing, let’s address that all-important question – which one should you learn? From my own experience, many would-be banjo players won’t even consider this question without first knowing which style is easier. When I’m confronted with this question by a student, my answer is always the same: that depends. Hopefully, this information will make the task of deciding which banjo style to learn a little less daunting. And the sooner you make that decision, the sooner you’ll be making some bee-too-tee-ful banjo music! Exciting, huh?